Highlights from day three on the CES show floor, which spilled over the Sands Expo, included a dynamic credit card, a smart pacifier, and an affordable 3D printer. LAS VEGAS, NEV. (TheStreet) -- The third day of the International Consumer Electronics Show (CES) in Las Vegas is the day in which the utter madness of more than 150,000 people cramped in casinos, conference halls, and coffee lines becomes a normal mode of existence. Building on the major theme of the Internet of Things (IoT), day three literally gave us everything connected, including a smart pacifier and an intelligent breathing chair. As we move over the hump of the week (The GEICO Camel might've been the only living creature not at CES), the day gave rise to in-your-face booth tactics ranging from the sad representative's aggressive plea for attention to over-the-top gimmicks, particularly at fitness company booths where women wearing skimpy workout gear did squats and thrusts while the mostly male audience looked on. 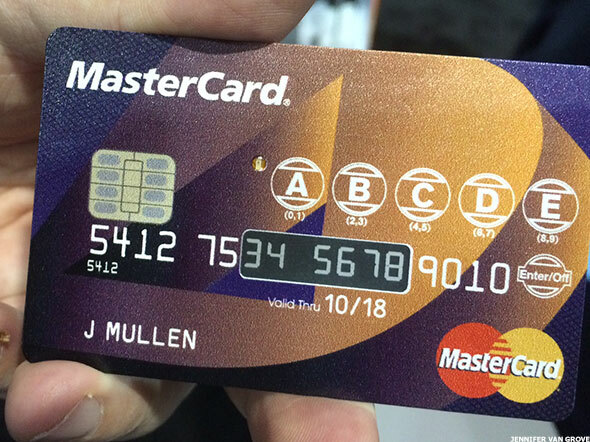 Announced at CES on Wednesday, the Hidden MasterCard hails from seven-year-old technology startup Dynamics and is a super secure MasterCard (MA - Get Report) with several layers of protection. It's named Hidden because the card hides your information. "There is no personal information on the surface of this card," Dynamics CEO Jeff Mullen told TheStreet. The card requires a code to be keyed in to unlock. Once unlocked, the card's dynamic number appears on the front, and simultaneously written to the card's magnetic stripe, EMV chip, and contactless chip. The card number and the security code both change every time the card is unlocked. Hidden will be available to consumers sometime in 2015, though Dynamics isn't providing a specific release date. Dynamics makes two other computerized credit cards that consumers can apply for now. The "ePlate" Visa V lets people swap rewards programs in and out by touching a button the face of the card. The Tim Hortons "Double Double" Visa, issued by Canadian Imperial Bank of Commerce CM, is linked to the Canadian coffee chain's loyalty program, and gives people the option of paying with their Visa credit line or "Tim Cash." 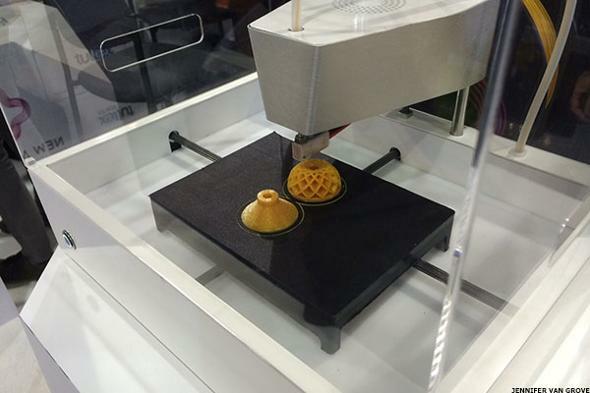 The label "most improved" actually applies to the category in general as 3D printing proved to be one the major, more-realistic-to-make-it-to-the-masses themes of this year's CES. The market is quickly maturing into something accessible to the average consumer, and the most accessible device, at least in price, is the New Matter Mod-t. The stylish Mod-t 3D printer is a compact beast that can spit out a small plastic knickknack or toy in an hour and half. 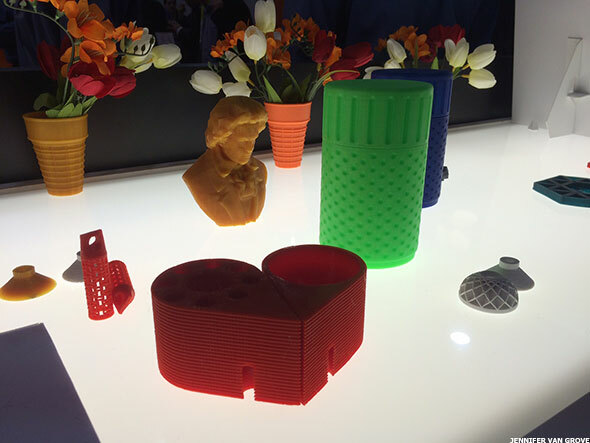 The printer comes with most of the bells and whistles you'll find on other printers -- it prints in PLA plastic and supports 100 micron layer thickness -- but will retail for less than $400 when it hits stores in the third quarter of 2015. And it's quiet -- like really quiet. The printer came to be thanks to a successful summer Indiegogo crowdfunding campaign that netted New Matter nearly $700,000 in financing from 3,500 believers in the product. Backers will receive their printers starting in March. Of course, whether you can make anything truly useful with a 3D printer is a subjective question with an answer that New Matter CEO Steve Schell was more than happy to supply. "Over the next three to five years is when we're going to see practical applications that resonate people," he said. "Out of the box it's going to be toys." The Mod-t also has its own online store of designs, which Schell sees as akin to an app ecosystem that will create demand for both designers and consumers. Every baby needs a smart pacifier, said no one ever. That mindset isn't stopping BlueMaestro, makers of Pacif-i, a bluetooth smart pacifier that measures a baby's temperature and shares the data with parents via Apple's (AAPL - Get Report) iOS or Google's (GOOGL - Get Report) Android app. 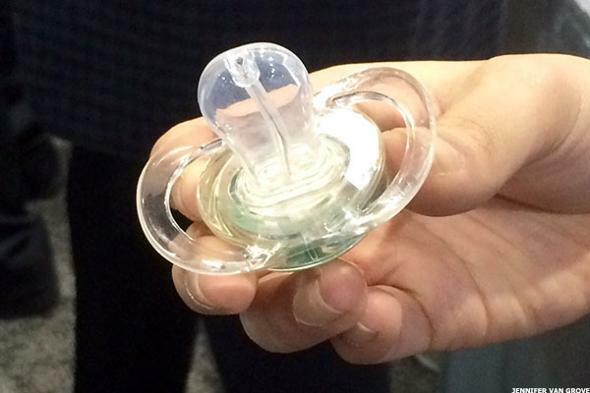 The pacifier can run for nine months after being turned and can be configured to alert mom or dad when it falls out of baby's mouth. Pacif-i is currently available for pre-order and retails for $40. On the opposite end of the affordability spectrum, we have the 02Chair, a "Breathing Chair" from Innovzen that comes with the catchphrase "remember to breathe." That may sound silly, but the chair helps to focus you on breathing in and out during a five-minute process that will slowly swing you on your back and have you breathing in purified oxygen. The Breathing Chair costs $9,500 at the lowest level, making it more of a novelty than anything the average person can afford and use. A company representative said, however, that the chair appeals to high-end clientele who want to relax more and to athletes who need to improve their breathing for a variety of reasons. And better breathing, the person said, has anti-aging effects and can improve health, memory, energy, and mindfulness; qualities most of us want. Weird doesn't necessarily mean bad and both of these unusual smart devices will appeal to some folks. The connected pacifier retails for such a reasonable price that it will surely attract the attention of the technophile parent. The breathing machine, meanwhile, certainly has spa appeal. 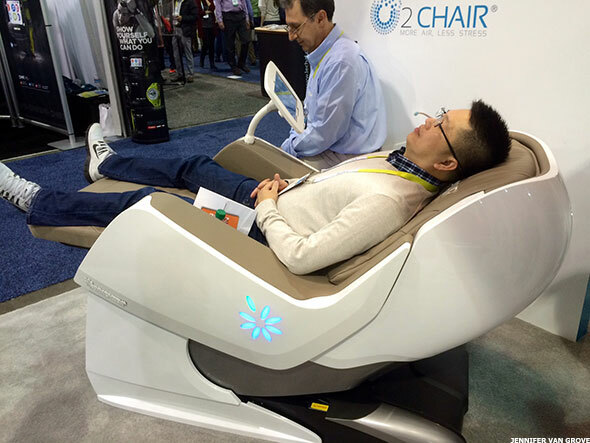 It isn't not too difficult to imagine walking into a luxury spa, in Vegas perhaps, and using the chair to help with rest and relaxation while on vacation (or at CES).